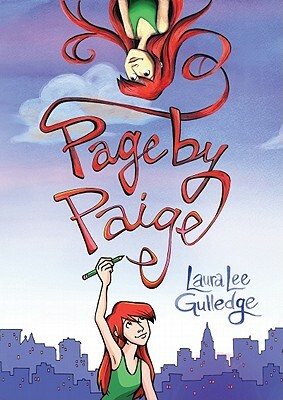 Page by Paige by Laura Lee Gulledge. Grades 6 and up. Abrams, 2011. 192 pages. Review copy provided by my local library. Geez, do you know ANYthing? I know I need to draw about it. So I bought a sketchbook. Paige's family has just relocated to New York City. It's huge. It's completely different from everything that Paige knows. And now she's faced with starting over: new friends, new school... new Paige? Here, Paige has a fresh start and she can be whoever she wants to be.... but who is that exactly? Paige isn't quite sure who she is, but she knows that she's not quite the person she wants to be. And if you've ever felt the same way, this is the book for you. Laura Lee Gulledge's gorgeous art expresses that wish for change and the process of going out to find it better than I could have imagined. This is a book that struck a chord with me and if I could go back in time and hand it to myself as a teen, I totally would. We definitely see Paige grow and change through the pages of this graphic novel. Her sketchbook helps her sort through things, giving us a glimpse inside her head. Other characters are similarly well-developed and we see Paige dealing with problems with her friends and her parents throughout the course of the year. The romance that develops feels organic and well-paced. The art is a perfect mix of funny and poignant, whimsical and dark. The art reflects the many facets of Paige's character and what she's dealing with. It changes with Paige's mood and thoughts, sometimes darker, sometimes lighter. This is a story that will resonate with many teens and it's a great graphic novel for your teen girls. Hand this to your artistically-inclined teens, but make sure it's also out there for the wallflowers who may be too shy to ask. Page by Paige was a finally for the 2011 Cybils Awards and you should also check out more reviews at GreenBean TeenQueen, Stacked, and Wyz Reads.